Homecountry by TW Lawless shows the strength of this Australian writers ability to produce a novel that not only captivates but puts you in a place of reality. TW Lawless entertains with humor, drama, love and a little bit of country lunacy. Born and raised in North Queensland but currently living in Melbourne Victoria TW Lawless has combined his life experiences in both parts of Australia into one book. He has created a work of fiction that makes Australians feel at home and brings those overseas to Australia. There is truth in his characters as they represent the culture of Australia and the life of the outback. Primarily set in 1987 Homecountry takes you on a journey into the life of Peter Clancy, a hard-drinking Melbourne Truth journalist. Returning to his hometown of Clarke’s Flat to bury his mother and settle the estate Peter Clancy’s short two day stay is soon stretched to eight as he is drawn back into the past and the secrets the town beholds. Peter is convinced by his childhood mate David Tindall, who is now a police constable, to use his journalistic skills and contacts to help him uncover the truth behind the 1960’s ‘suicide’ of David’s father and another man. With Aboriginal Sam Saturday supporting David, Peter is soon convinced that things are not as they seemed. TW Lawless writes with an easy to read flow that draws you in and captivates you, throwing in a little humor from time to time that has you snickering and grinning from ear to ear. My initial thoughts after reading two pages of Homecountry was that this was definitely a man’s book, but how wrong I was. 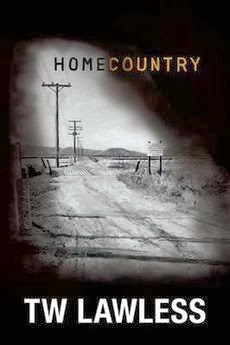 Homecountry is a book that suits both sexes and a vast age range. The content is manly do a degree but it soon had a woman like myself wanting to turn the page to find out more. Homecountry is a thriller that leaves you asking questions and wondering about the plans and motives of those around you. What is going on in your town? Is Clarke’s Flat possibly an example of country towns within Australia? On his site TW Lawless states that Homecountry is an idea he has carried in his head for twenty years. In the early 1990’s he sat down and wrote a book in longhand, had it typed and sent it to several publishers. After receiving rejection letters he soon became discouraged saving the publishing of his first book until he became older, wiser and more determined. Readers will be thankful that he eventually found that little place within himself that gave him the courage to take the leap into publishing. TW Lawless is a storyteller who leaves you breathless with anticipation. Homecountry has definitely left me wanting more and wondering what is being created in the mind of this Australian author. I await book two with anticipation.